Bruxism is a habit that affects around 8-10% of the population. It is broadly characterised by grinding of the teeth and clenching of the jaw that causes tooth wear and breakage, disorders of the jaw (pain and limited movement) and headache. Bruxism occurs in both children and adults but is most common in 25-44 year olds. However, most people grind and/or clench their teeth occasionally to a certain degree. Bruxism is classified into awake bruxism and sleep bruxism. 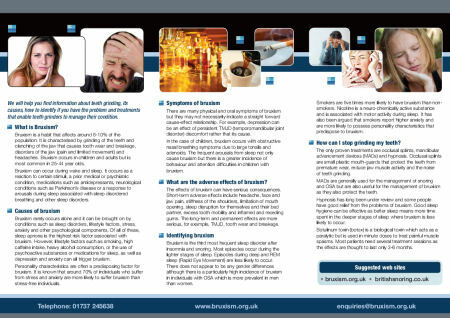 Awake bruxism is characterised by involuntary clenching of the teeth and jaw bracing in reaction to certain stimuli. There is generally no tooth grinding with awake bruxism. Sleep bruxism is characterised by automatic teeth grinding with rhythmic and sustained jaw muscle contractions. Bruxism is further divided into primary, (that occurs without any prior medical condition) and secondary bruxism, where a medical or psychiatric condition is known. The teeth grinding observed during wakefulness and secondary bruxism can be associated with certain medications such as antidepressants or recreational drugs such as cocaine and ecstasy, and disorders such as Parkinson's disease, depression and major anxiety. Many studies have found that there are other characteristics associated with sleep bruxism because it rarely occurs alone. Sleep bruxism occurs as a response to arousals during sleep (periods of awakening), indicating that it may also be a sign of a sleep disorder. Nearly 80% of bruxism episodes occur in clusters during sleep and are associated with these arousals. The strongest association has been found between sleep bruxism and Obstructive Sleep Apnoea (periods of stopping breathing during sleep), which is a condition that is often accompanied by daytime sleepiness and non-restorative sleep. Individuals with OSA have many arousals during the night due to their breathing difficulties. The termination of the apnoea event is often accompanied by a variety of other events such as snoring, gasping, mumbling and teeth grinding. OSA has been found to have the highest risk factor for tooth grinding during sleep than any other sleep disorder. Significant associations with sleep bruxism have also been found with other sleep conditions such as sleep talking, hypnagogic (state of consciousness between sleep and wakefulness) hallucinations, violent or injurious behaviours during sleep and REM sleep disorders. Psychological disorders such as stress and anxiety are also known to exacerbate teeth grinding during sleep. In one study, around 70% of sleep bruxists related their nocturnal teeth grinding to stress and anxiety. Bruxism is also more prevalent in individuals who regularly use alcohol, tobacco and caffeine (6 cups or more per day). There is no specific cure for bruxism and it is important to manage the consequences of the disorder. Various preventative measures including mandibular advancement devices, drugs, stress management and occlusal splints have been used. However all but occlusal splints have demonstrated adverse effects which reduces their appropriateness.